There's no doubt that traveling to new places is amazing. Being submerged in a different environment, climate, and culture is always exciting; however, traveling is difficult on our bodies. Since we travel at a speed and height that we aren't used to it can really aggravate our vata dosha. We are traveling at a speed that is not natural so it can be hard for our minds and bodies to adjust, especially if you travel long enough to experience jet lag. Luckily, Ayurveda has tips for getting back on track more quickly after a trip. 1. STAY HYDRATED and drink warm or room temperature water if you can. Drinking more water while we are traveling helps to keep the vata dosha calm. Try to avoid caffeine, alcohol, and sparkling drinks during travel time as it can aggravate vata dosha more and dehydrate you. 2. TAKE A NATURAL SEDATIVE like mint tea, or a ginger or cinnamon capsule. These supplements work as a sedative to keep you calm during your travel and help reduce anxiety and worry. 3. EAT A VATA REDUCING DIET reduce drying foods like dried fruit, potato chips, crackers, popcorn while traveling. These foods increase vata. Eat more grounding, warming foods, even oily foods. 5. ABHYANGA or self-massage, preferably with sesame oil can ground and calm us after traveling. On your first night give yourself an abhyanga, take a hot shower or bath and hit the hay and get a good night's sleep! 7. 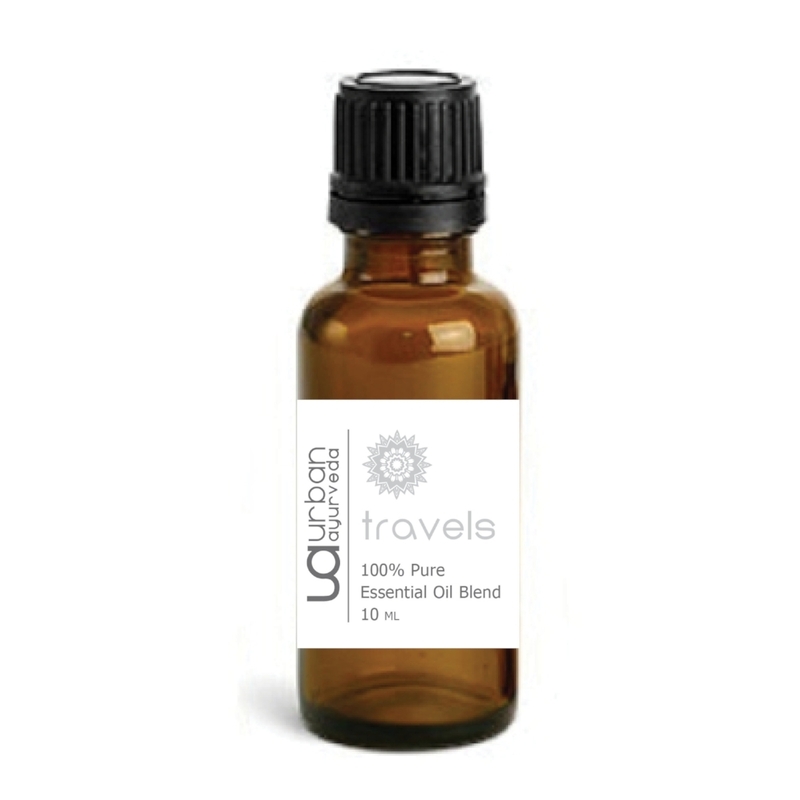 TRAVEL ESSENTIAL OIL is a 100% pure essential oil blend designed for the traveler who wants to keep virus and bacteria away.